I have just finished my sunshine and sea quilt that I started just after I came back from Australia… and I am really pleased with how it turned out. I keep looking at it and smiling. It reminds me so much of the fun time we spent at the beach, when the sun was shining and the water was warm. On this cold and over cast Portland day it reminds me that sun does shine, somewhere! Summer is not going to come quick enough for me. The overcast day does have one advantage – it is great for taking photos (as long as it is not raining!). Okay, enough about the weather… moving on. With this quilt I have been struck by how a quilt pattern can change when you sew the whole quilt together. I rarely map or sketch out the finished quilt. I really like to just see where it all takes me, for better or for worse. So I started the process with an easy block that looked like this. The pattern in the block is like a simple star with four points. I mirrored the block pieces to give it a more interesting effect. 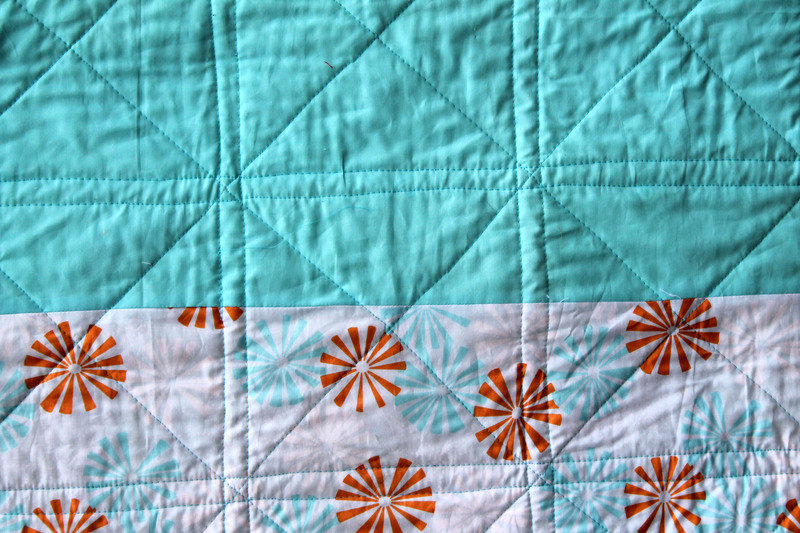 When I look at the quilt now I struggle to find the stars, all I see is a pin wheel. The original pattern is in there, I just have to search a little harder for it. This quilt was really quick and simple to make but the interesting part came when I was sewing it all together. There are sections of the quilt where 12 block pieces meet which causes a little bit of bulking, even with sewing seams flat. To help with the bulking I chose quilting that would go through and around the center of this join. In having so much quilting through the bulk it helped flatten and strengthen this area. It also made for a lovely pattern of quilting. 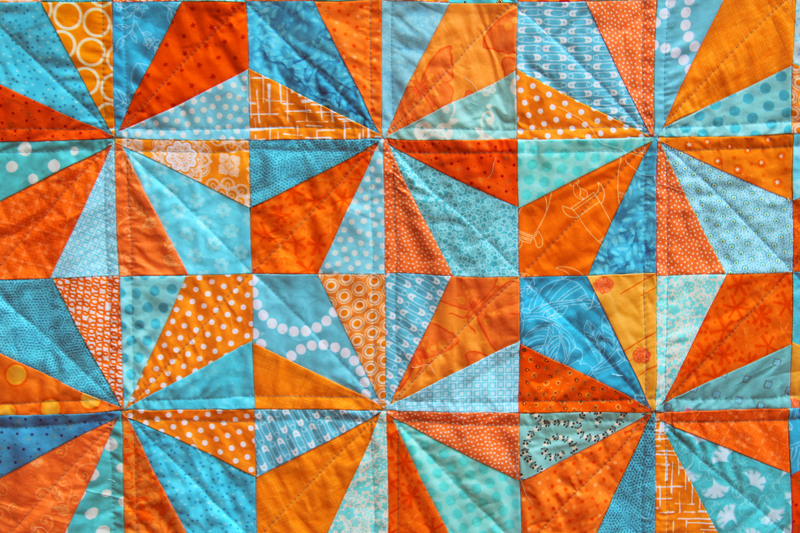 A pieced back and scrappy orange binding finishes the whole thing off. I must admit it had been a month or so since I had hand stitched the binding on a quilt and in that time I seem to have forgotten how to do it. The stitches at the start are a little big and a little rough, but by half way through the process I was back to invisible stitches. I was tempted to unpick it all but decided to leave it be. Looking at the small section where the hand stitching is visible reminds me that the quilt is hand-made and that a lot of effort has gone into the finished product. 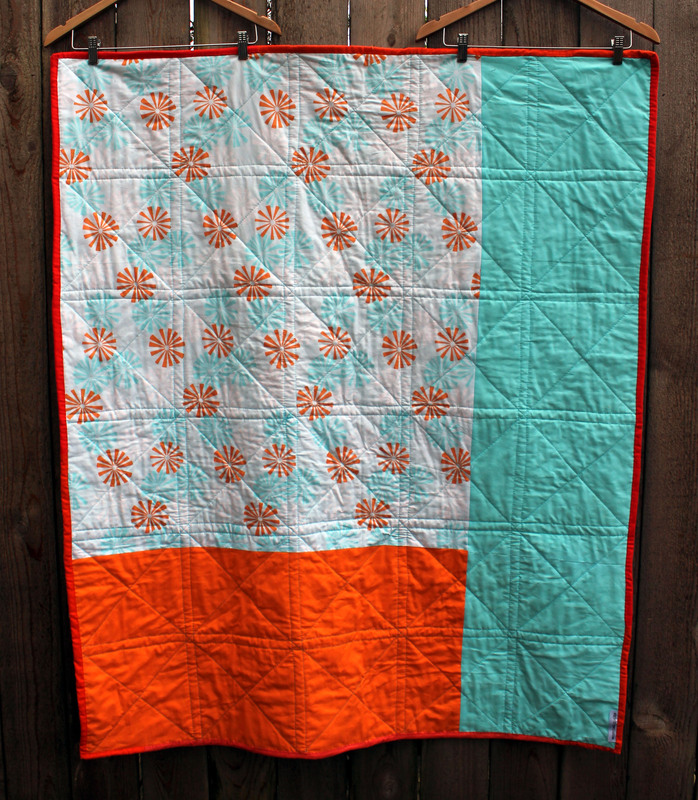 I love your Sun and Sea quilt….. 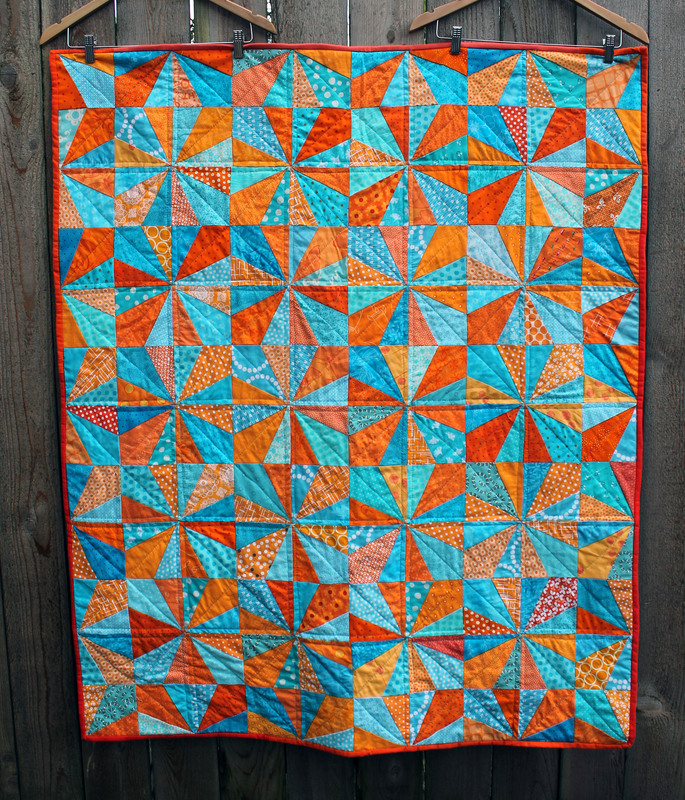 Especially the colours – because I just finished a quilt today, too, and it has the same colour theme! How cool is that? I guess we are both wishing and willing spring to get in gear and warm things back up. Cute. Congrats on your finish. Such happy colours and exactly what we need with spring long overdue. I saw some fabrics in these colors a few weeks ago and started a quilt with these colors too. What is funny is that almost the same words came to mind for my quilt, Water & Sun is what I think I’ll call it. BEAUTIFUL fabrics. Great color choices. LOVE LOVE LOVE the back! 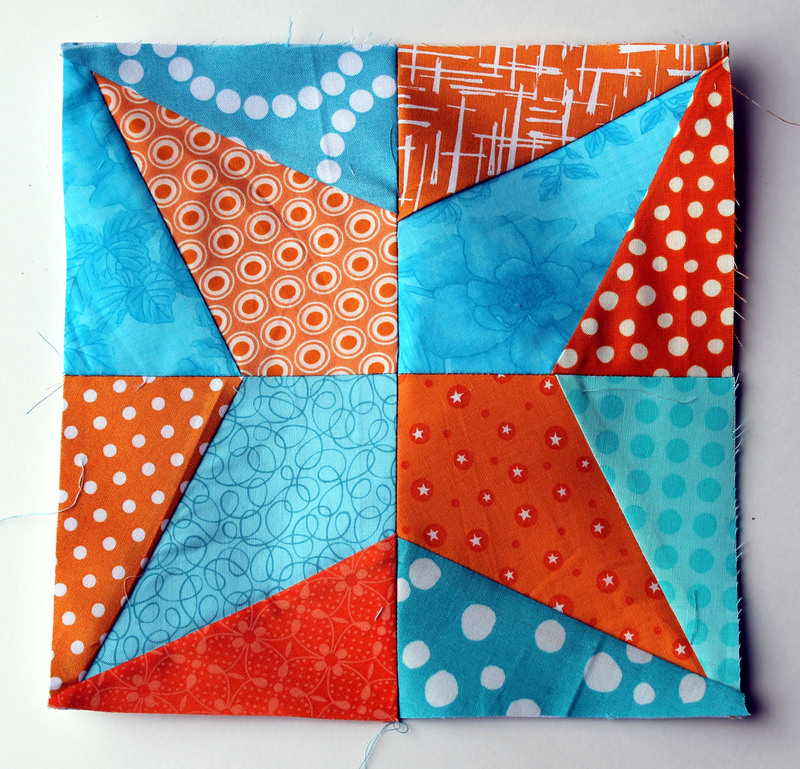 Glad the quilting flattened the block. I had that happen when I made one like this too. Congrats on your finish. Wow, I love the colours and the secondary pattern. What a great serendipitous finish. Thanks. I am still a little disappointed the pattern is not as clear but the end result works. I love this quilt! Thank you so much for sharing. I’ve been looking for something to make for my grandson, and would love to do something similar to this one. Can I ask what size blocks these are? My finished block was 11 inches square – made up of four x 5 1/2 inch block pieces. A random size I must admit but it meant I could fit two of the block patterns on a piece of paper! Thanks G. I have almost as much fun making the backs some time.